Even the landlady who rents these rooms in this fine communal house cannot fathom the evil incarnate that resides in that merciless stuffed bear. As I said, it belongs to the man in the next room. This man, in and of himself, is cut from ordinary cloth. Yes, he has fallen on hard times, as have many of us. And he claims that the bear was a final gift from his daughter, although why he used the term “final” I do not know. Perhaps it is because the child knew that the bear was possessed? Or perhaps, it was that very same little girl who placed the curse upon the cursed bear herself. In either case, it matters not. All that matters are the whispers that began to vex me less than a week after the man took up residence next door. 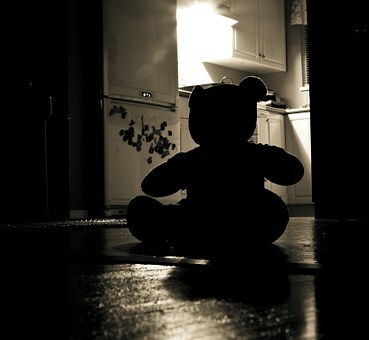 Tiny whispers at first, and I could see the cold round eyes of the bear shining in the darkness, taunting me. At first I courted the notion that I was losing my mind. But then I assured myself, through logic and my keen sense of deductive reasoning, that it was not I, but the bear who was the cause of my affliction. And night after night the bear continued to whisper. I could hear it in the walls, and under my bed, and through the door, and from the radio on the nightstand. The night came when my restlessness could no longer be assuaged, and the damn stuffed bear’s voice was ringing in my mind like the gong of a cathedral! I vaulted out of bed, grabbed the scissors and the needle and thread that I had prepared, and broke open the man’s door! And there, there on the nightstand sat the cursed bear! It grinned at me, and its eyes shined with fire and crazed fury! Startled, the man sat up and screamed with fright, but I lunged upon him, and a moment later the deed was done!